We are engaged in offering high quality Inductive Proximity Switches. These products are manufactured using optimum-grade material that is sourced from vendors of high repute. All our products are applauded for their high performance, low maintenance and longer service life. In our range; we offer Inductive Proximity Switches, Extended Sensing Proximity Switch and Analog / Linear Proximity Switch. Inductive Proximity Switches, available in varied shapes & sizes, are a reliable option for applications in Machine tools, Foundries, Rolling mills, Automobiles, Textiles, Pharmaceuticals and Material Handling systems. This type of switches works on 'Damped Oscillator' principle. During operation, a frontally radiated electromagnetic oscillating field is projected from the sensing face. Any electrically conductive material entering this field causes damping of the oscillations. This change is detected by the in-built sensitive & reliable electronic circuit and is converted into an effective output signal. The standard Inductive Proximity Switches can sense any metallic (electrically conductive) object. However, we have a special type of switches to sense either only ferrous objects or sense only non-ferrous (Cu, Al etc.)objects. The details for the non-ferrous sensing switches are described elsewhere. this switch has a dome-shaped electro-magnetic field present in front of the sensing area. The switch will sense the object entering into this domain. This is the distance between the target and the sensing face at which the switch operates. This is usually specified considering M.S. as the target material. All standard inductive switches sense the presence of any metal but will offer stated sensing distance only for ferrous materials like MS.The type SW 4051-NF is specially developed to sense only non-ferrous metals such as Copper, Aluminium, Gold, Tin, Zinc etc. The biggest advantage of this type of switch is that the non-ferrous objects are sensed from larger distances as compared to standard models. These switches are available in M18 and above sizes. The other operating features are same as those of standard 3 wire DC Switches. 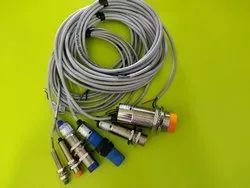 HIGH-PRESSURE SWITCHESSpecial high-pressure type Inductive Proximity Switch has been developed for direct use in a Hydraulic Cylinder. The switch construction is sturdy and is rated for pressure up to 500 bar. These switches are also available in connector version for easy replacement. Sizes & Sensing DistanceThese switches are available from 4 mm dia. to 140 mm dia with sensing distance from 0.5mm to 100 mm.